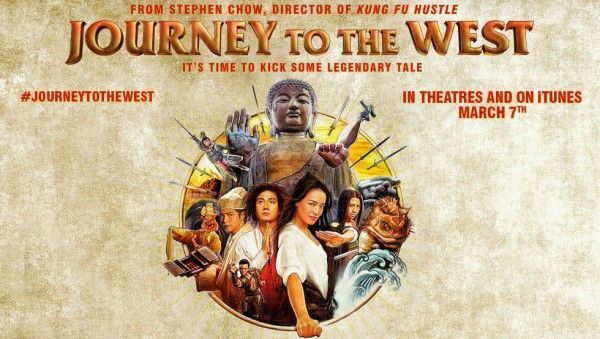 About a year ago, we posted the Hong Kong trailer for Stephen Chow‘s Journey to the West. The film centers on a group of demon hunters who use the power of love to save people and embark on a journey to the West. That plot doesn’t really come through in this new U.S. trailer, which is more about Chow’s general energetic, madcap visuals. The look of the movie should come as no surprise to those who have seen his previous films, Shaolin Soccer and Kung Fu Hustle. This time around, Chow is playing heavily with CGI, and while the CGI doesn’t look particularly good, it does fit with the cartoony style he’s apparently going for. Hit the jump to check out the trailer. The film stars Qi Shu, Zhang Wen, Bo Huang, and Lo Show. Journey to the West will be available on iTunes and in theaters on March 7, 2014.